Visitors walk through the towering trees at Carmanah Walbran Provincial Park in central Vancouver Island. Outdoor columnist Sandy McRuer discovered a few different ways to find trails in the Alberni Valley and elsewhere on the Island. 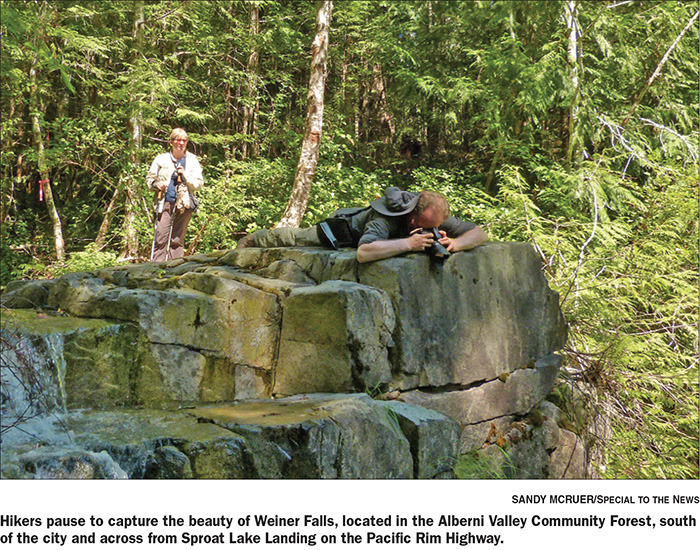 Writer offers tips on finding local trails in the Alberni Valley. I have heard this kind of comment so many times over the years. I’ve heard so many people complain that there are no maps or signs. And it has been a source of frustration for many, many people. I’m not about to get started about how things should change. But I am about to give you some suggestions that might help. There are three kinds of sources for information; paper-based, Internet-based, and GPS-based. There are two hiking books that cover the Alberni Valley area. One is called Hiking Trails 2: South-Central Vancouver Island and the Gulf Islands, 9th edition. This publication has been around a long time. There is a website where you can order the book, or check to see if there are updates to any of the trails. Or you can stop in at the Visitor Information Centre and pick one up. The other book is exclusively for trails in the Alberni area and is called the Alberni Valley Trail Guide. It has not been revised since 2006. So there are parts of it that are out of date. They are also available at the Visitor Information Centre. There are a couple of places where you can find maps and descriptions of trails in the valley on the internet. The Alberni Clayoquot Regional District has a list of eight trails on its website: www.acrd.bc.ca/trail-maps. Some of these are the same as in the Alberni Valley Trail Guide. The visitors’ centre also has a tear-away map with some of these trails listed as well as directions. If you like strenuous hikes in the mountains, Quagger has a large variety of choices for you on his website, including many around the Alberni Valley. See http://islandhikes.com/. The PA Cyclers have a series of maps of trail rides around on their website: www.pacyclers.com/Resources. There is also a quirky little document about “bouldering” at Sutton Creek: http://members.shaw.ca/suttonboulders/Suttonboulders.pdf. There is also the local hiking club’s modest little website here: albernivalley outdoorclub.wordpress.com/. But the best choice of places to hike is found in websites and smart phone apps devoted to GPS technology. The big advantage of this is that by using a GPS you have a huge level of certainty about where you are in unfamiliar terrain. Given that the signage for many trails is poor and changes have been made, having a GPS and knowing how to use it is very helpful. And there are a bunch of sites offering GPS. Below is a small sample of what is out there. I discovered Trailpeak a few years ago. It is focused mostly on Canada. If offers an ability to download GPS tracks to your device. You can either pay $25 for 10 credits and use them to download 10 tracks, or upload your own track to earn three credits for downloading. All the trails are uploaded by users so Trailpeak takes no responsibility for them. That being said, I’ve has no difficulties with them around here. There are around 30 trails available including three or four duplicates. I have uploaded a bunch myself. EveryTrail is most popular in the United States but is worldwide in scope. There are about 24 or so trail uploads. Some are of dubious quality. But there’s a very nice guide to Della Falls and Fossli Provincial Park. Downloading is free. And best of all, it can be used in a smart phone. A caution: smartphone batteries don’t last nearly as long as regular GPS devices. After two or three hours they will fail unless you have a portable iPhone charger. They are available now. Finally Wikiloc is much like Everytrail. You need to register, but it’s free and then the downloads are free. You can download the files to be compatible with smartphones, Garmin or Google Earth. You will be asked for a donation after you receive your file. At the moment there are about seven trails that people have uploaded. So that’s a basic primer for what’s on line for trails in the Alberni Valley. I urge you to get out and find your own trails, bring your iPhone and contribute to these apps. The word is out. People know there are trails. Do your part to help them find all the wonderful spots we know there are here. Next month I’ll give you some other ways to find trails.